Osimertinib, an oral TKI, is an important new treatment option for patients with EGFR T790M–mutated metastatic NSCLC that progressed during or after therapy with an EGFR TKI. 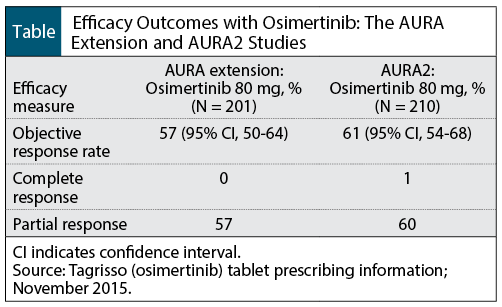 Overall, 2 phase 2 clinical trials demonstrated that osimertinib achieved objective tumor responses and acceptable tolerability in this patient population. 1. Molina JR, Yang P, Cassivi SD, et al. Non-small cell lung cancer: epidemiology, risk factors, treatment, and survivorship. Mayo Clin Proc. 2008;83:584-594. 3. Kwak EL, Bang Y-J, Camidge DR, et al. Anaplastic lymphoma kinase inhibition in non–small-cell lung cancer. N Engl J Med. 2010;363:1693-1703. Erratum in: N Engl J Med. 2011;364:588. 4. National Comprehensive Cancer Network. NCCN Clinical Practice Guidelines in Oncology (NCCN Guidelines): non-small cell lung cancer. Version 4.2016. January 12, 2016. www.nccn.org/professionals/physician_gls/pdf/nscl.pdf. Accessed January 26, 2016. 5. Pao W, Miller VA, Politi KA, et al. Acquired resistance of lung adenocarcinomas to gefitinib or erlotinib is associated with a second mutation in the EGFR kinase domain. PLoS Med. 2005;2:e73. 6. US Food and Drug Administration. FDA approves new pill to treat certain patients with non-small cell lung cancer. Press release. November 13, 2015. www.fda.gov/NewsEvents/Newsroom/PressAnnouncements/ucm472525.htm. Accessed December 28, 2015. 7. AstraZeneca. Tagrisso (AZD9291) approved by the US FDA for patients with EGFR T790M mutation-positive metastatic non-small cell lung cancer. Press release. November 13, 2015. www.astrazeneca.com/our-company/media-centre/press-releases/ 2015/TAGRISSO-AZD9291-approved-by-the-US-FDA-for-patients-with-EGFR-T790M-mutation-positive-metastatic-non-small-cell-lung-cancer-13112015.html. Accessed December 29, 2015. 8. Tagrisso (osimertinib) tablet [prescribing information]. Wilmington, DE: AstraZeneca Pharmaceuticals; November 2015. 9. ClinicalTrials.gov. AZD9291 versus Platinum-Based Doublet-Chemotherapy in Locally Advanced or Metastatic Non-Small Cell Lung Cancer (AURA3). https://clinicaltrials.gov/ct2/show/NCT02151981?term=NCT02151981&rank=1. Accessed December 29, 2015. 10. ClinicalTrials.gov. Osimertinib. Search results. https://clinicaltrials.gov/ct2/re sults?term=Osimertinib&Search=Search. Accessed December 29, 2015.